Home / Store & Product / How to Simply Bulk Upload your Products? How to Simply Bulk Upload your Products? One of the most challenging stages in setting up a webStore is adding products in a robust, quick and effective manner. This can be achieved using webShaper’s import tool which allows multiple products to be added in a go. Note: Getting your Products Sorted and Adding your Product Information are prerequisites for the bulk upload, please make sure you complete these before you proceed onto the steps for bulk upload. To know how to work with your images, go to Step 2. 1. Under Products, on your Dashboard you will find Import/Export. In the dashboard, under Products, you will see Import/Export. 2. Download the sample under Import Products and get the excel file sample. Open this downloaded .xlsx file in your Microsoft Excel. 1. Feel free to manipulate the file and insert your own product information. After you have inserted your own information you will have to upload the file as demonstrated in step 1.
i. Products with two options must be in different excel sheet, to separate out the ones with one option. So if you have only one product option, as example Colour, then you need to remove ‘Option 2’, ‘Attribute 2’. ii. We have added more columns for your benefit. Feel free to add more options as you desire. There is a list of options provided and what each option does, follow the link to know more. 2. Save your .xlsx file. 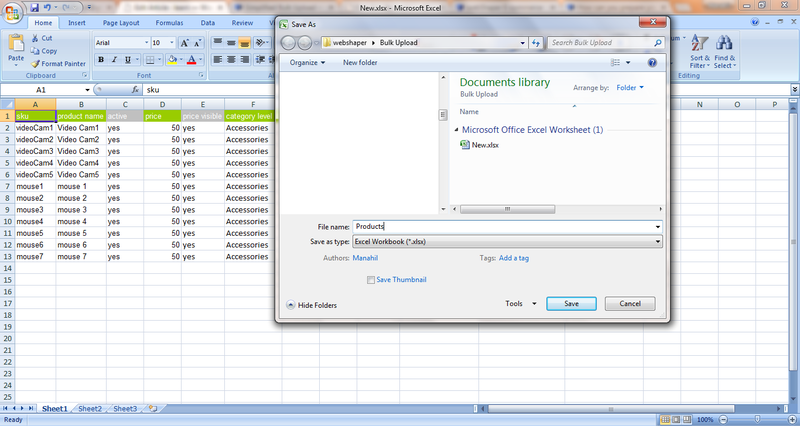 Save your Excel file with the changes made, ready for uploading. 1. Click on Import Products. 2. Select your excel file with all the product information and select Excel for Type. 3. Add New Products (if you are adding in new products to your online store) or Update Products (if you are updating your products). 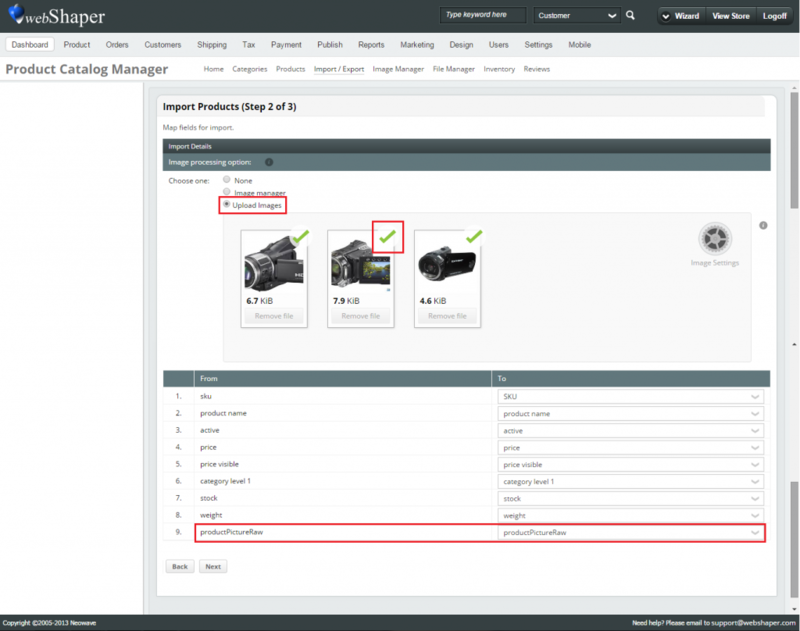 Ways to add images to your product is by “Drag and Drop” your product images into the image gallery. Note: If you have uploaded your product images via image gallery, then delete the productPictureSmall, productPictureNormal and productPictureRaw fields from your excel file. productPictureRaw: is your product image name and file type; e.g iPhone5_black.jpg (this only applicable for product images uploaded via image gallery). You can learn how to upload products via image gallery here. To successfully upload your images into the system, you must make sure that the field in your excel file is named correctly as productPictureRaw. A green tick will appear on the top left of your picture showing that it has been uploaded without any issues. folder-name/normal/picture.png . You can put this in your excel file accordingly. 1. Your products have to now be inserted into the system. Note that your field names may not map exactly onto each other. Check to see if they correspond correctly by comparing the fields. 2.Proceed to the last step of bulk upload, click next. 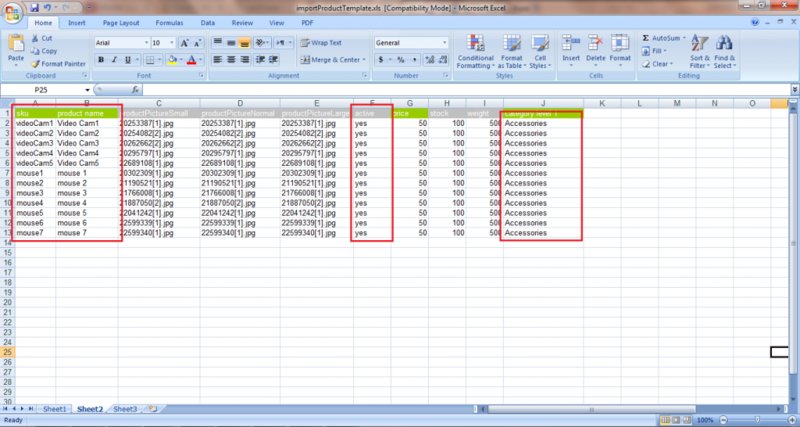 Here you can see the details of your Excel File. 3. You are almost done! You can also check whether your products have been uploaded successfully into the system. Click on View Log/Previous File Uploaded under Import/Export. Your successfully added products will be shown to you. Important: The webShaper system can support up to 99 products in a single upload but this is not advisable as it might slow down the bulk upload process.